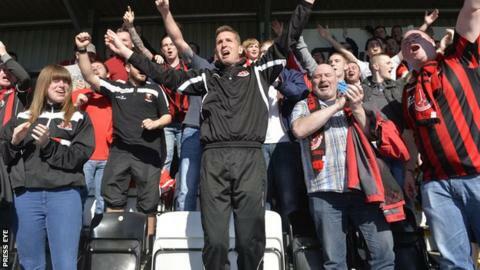 The Irish Premiership is the second cheapest league to watch men's football, a BBC study has revealed. It has been included for the first time in the Price of Football study, which analyses the costs at 227 clubs in 13 leagues across the UK. The league's set £10 admission fee and the average cost of the cheapest season ticket - at £124.73 - is lower than all divisions in England and Scotland. Ten out of the 12 clubs in the Premiership provided data to the BBC. Prices from Warrenpoint and Ballymena United were obtained from their club websites. "The admission charge of £10 allows fans to plan their budget around going to a game each week and is something that our clubs have done for many years now," said Northern Ireland Football League managing director Andrew Johnson. "In fact the £10 is a maximum charge which allows the clubs flexibility to offer fan promotions for various games throughout the season. I believe it provides excellent value for money." The Price of Football, now in its fifth year, analyses the cost of the cheapest and most expensive match-day and season tickets, as well as the cost of a pie, programme, cup of tea and adult and junior replica shirts. In England's Premier League, two thirds of tickets were frozen or reduced in price but the cheapest match-day ticket now costs more than £30. The Welsh Premier League came out as the cheapest league to watch men's football in the UK, with the average cost of a match-day ticket at £7 and the average cost of the cheapest season ticket at £71.64.